What is Windows 10 bringing to the Enterprise? 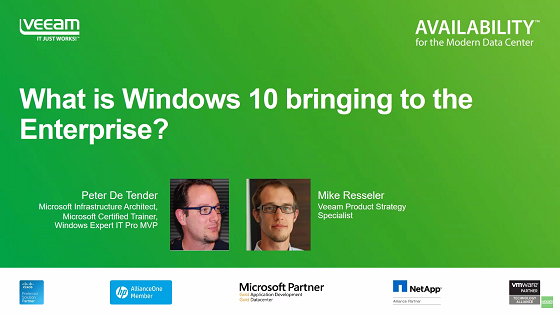 Although the new interface is an important aspect of the Windows 10 adoption, this session will mainly focus on all the other great stuff to talk about. Starting with the security approach in the Operating System, we’ll guide you through the identity security features Windows Hello and Hyper-V Virtual Secure Mode (VSM). We’ll also discuss the different deployment options you’ll have when migrating to Windows 10, and end with a few words on mobile device management using Azure AD Join. Register now and learn what Windows 10 is bringing to your enterprise, and how you as a system administrator should prepare to adopt Windows 10.